I must thank colleagues in Years R, 1, 2 and 6 who all hosted parent information events this week. If you were not able to attend, please do not hesitate to make contact with your child’s teacher who will be able to provide you with any information or material that you may have missed. Year 4 ended the week by going completely Goofy. And Mickey, Minnie, Donald and endlessly Princess, as they had a Disney day on Friday. Well done also to the pupils in Years 5 and 6 who celebrated a wonderful Mass on Tuesday with Fr Jeremy, where once again we were joined by a large group of family members. As I always say though, please do not worry if work or other commitments keep you from joining these events; we know how much home support goes into preparing children for these occasions, and we know that everyone in the community is with us in spirit when we gather to celebrate, pray and worship. And that’s it, another half term gone! Whilst I was out on the playgrounds for end of the day dismissal on Thursday, there was a hint of spring in the air, and on the lawn just in front of the hall windows, the daffodils are venturing forth to burst into bloom any day now. So, as we say farewell to winter, and prepare for longer days and brighter sunshine, what better way to spend a half term week than relaxing, enjoying some fresh air and passing time at leisure with our families and friends. This week has seen the second round of pupil progress meetings in school between the Senior Leadership Team and class teachers. It is our termly opportunity to focus on the progress of each child and decide upon targets and techniques that will make for further academic gains in the coming months. As is often the case in such meetings, the role of the Headteacher is to always ask for ‘a little bit more’, and with everyone at school already working hard I know that I am like a Formula 1 team manager who wants to shave fractions of a second off each lap time for the sake of marginal gains. However marginal these gains may be, though, their impact can be great; on the race track it is the difference between winning and losing, in the classroom it is the difference between meeting ambitious learning targets or falling frustratingly short of them. So, now that we have a renewed sense of what each pupil can achieve as their next step, they will find the expecatations of staff going up a notch or three in the coming weeks. You can support this by adding to the process with consistent home learning. This does not need to be huge amounts, and should not make learning a horror for children or families alike, but devoting a set time several days a week to support school learning will really make a difference. 10 minutes of reading, spelling memory games after tea, or setting mini maths challenges into daily tasks around the house all add up to those small steps making a big difference. Praise this week needs to go to pupils who have flown the flag for St Peter’s in other local schools. Year 4 sent a team of keen sportspeople to Horndean Technology College for a Tri-Golf tournament, where the boys team brought home a well-deservde silver medal. 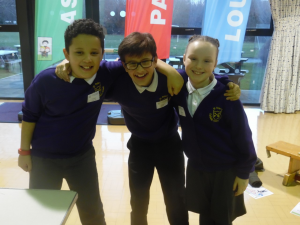 Year 5, three pupils (pictured below) gave an exceptional account of themselves in a CAFOD public speaking competition on the topic of ‘What’s for Dinner?’ at St Anthony’s Catholic Primary School in Fareham. Well done then to all the pupils involved, and thanks to Miss Rayson (Tri-Golf) and Mrs Edge and Miss Fleming (CAFOD public speaking) for devoting their efforts towards these enriching activties. Well done to Year 5 for boldly going where no pupils have gone before, this school year from St Peter’s at least, and making the trip through the wind and the rain to the Intech Science Centre just outside Winchester. Thanks you to the staff and volunteers who made this trip possible. The Year 5 pupils have been astounding me in recent weeks with incredible home learning work on the planets and life in space. The space topic has inspired the children really well, and who wouldn’t be hooked into doing maths based upon planet temperatures in Star Wars! Some great models and information posters have been made about our solar system by Year 5, some of which are on display in the school foyer, but you will need to be quick to see them as Year 2 Titanic models are ready to set sail for centre stage during next week. The talent in school is not just limited to classroom lessons and home learning though. Pupils in Mrs D’s after school Story Time Club have put together an hilarious story of their own based upon a well-known series, writing ‘Supertato – Classroom Chaos’ in the autumn term. 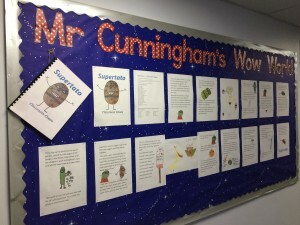 This amazing publication has been granted the honour of sole residence on Mr Cunningham’s Wow Work! wall outside my office (see below). In addition, the publication was well received (and reviewed) by the Supertato authors themselves who wrote a wonderful letter to the Story Time Club pupils at the start of the term. To top of this triumph, ‘Supertato – Classroom Chaos’ was the most borrowed book in our school library in January, so well done to all the pupils involved. And finally, in the sporting spirit of fair play and neutrality, I hope that any of you who are interested in rugby enjoy all that the Six Nations has to offer, and may the best team (as long as they play in white and have a red rose emblem) win!